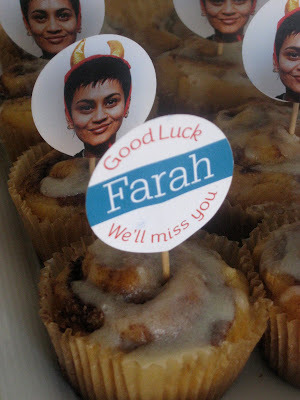 Mini Cinnamon Buns: Ooey, Gooey and Mhm Sticky / Hey, EEP! 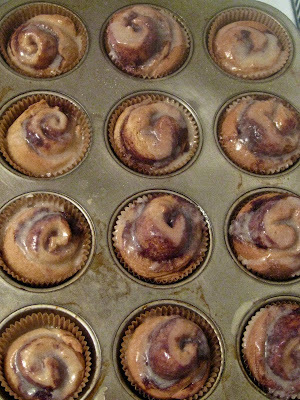 Oh cinnamon buns, how I long for thee. This recipe is nearly fool proof, which is a lot to say about a yeast dough recipe. What you get is a sweet-buttery bun wrapped around a cinnamon-sugar filling. After they've cooled slightly, they're drizzled with the a glaze that could turn even the sternest chef into a giddy finger-licker. 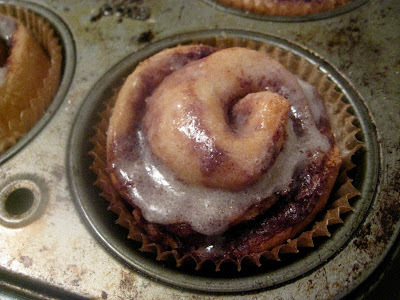 These cinnamon buns were developed to match the Cinnabons you find in malls. Let me tell you, they are dead on. 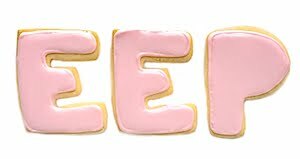 The secret is in the glaze: Butter is added to a combination of water, confectioners' sugar and vanilla to give it a final kick of richness, that melts down into the buns. Those mall buns are the size of my face! Try these miniature version for something just as tasty, and a tad more delicate. Separate the dough into two balls, then roll out into 2 rectangles (instead of 1 larger one) , following the step-by-step instructions. Add the filling and roll up following the step-by-step instructions. 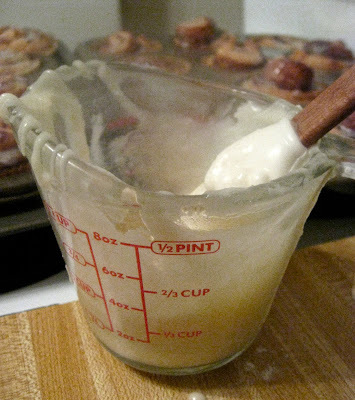 Slice the dough into 1-inch rounds and place one round into each cup. Bake according to the instructions, glaze and enjoy! Ooey Gooey is good with me!